Vintage Art Drawn Old Card. 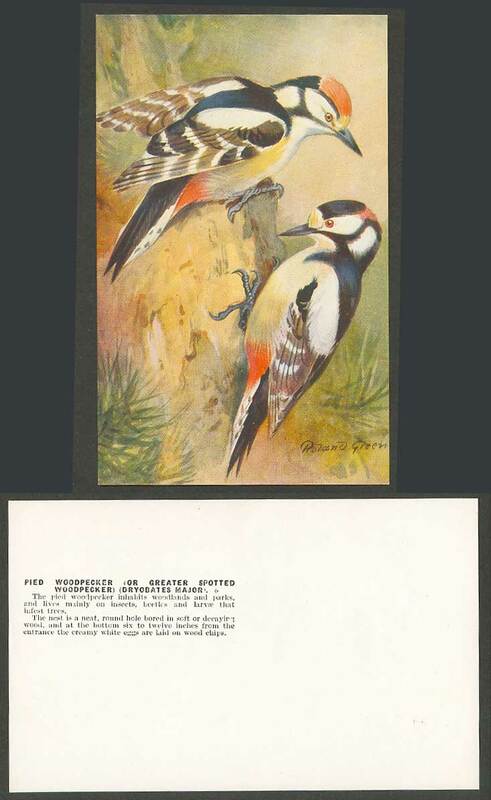 Pied Woodpecker Bird Birds, Roland Green Artist Signed. Pied Woodpecker, or Greater Spotted Woodpecker, Dryobates Major. The Pied Woodpecker inhabits woodlands and parks, and lives mainly on insects, beetles and larvae that infest trees. The nest is a neat, round hole bored in soft or decaying wood, and at the bottom 6 to 12 inches from the entrance the creamy white eggs are laid on wood chips.